Front cover, Metalsmith magazine’s Exhibition in Print 2015 – Moved by Metal: On Beauty as Interaction.” Published by Society of North American Goldsmiths. Guest Curator: Wendy Steiner. 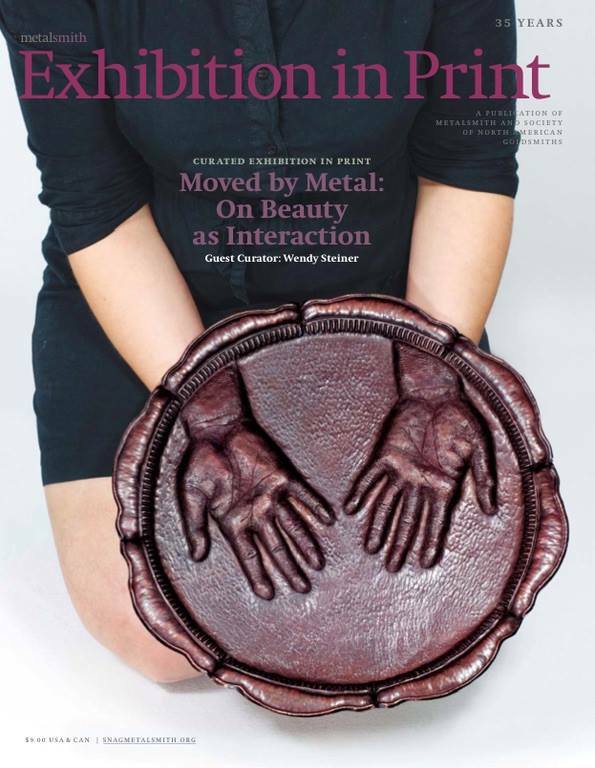 The newest issue of Metalsmith magazine hit newsstands across North America this month with its “Exhibition in Print 2015 – Moved by Metal: On Beauty as Interaction.” Imagine how stoked I am to be included in the company of some of the finest talents in our field of metalsmithing, jewelry and sculpture. Guest curated by Wendy Steiner (Richard L. Fisher Professor of English Emerita at the University of Pennsylvania and published author of several books on the topic of beauty), this unique insight into metal artists is based upon the ideal that beauty is not only an observation through our eyes – but an interaction or participatory experience in the viewer. This issue is released annually in both print and digital online subscription and has become almost a “bible” to the field of metals/jewelry over the last twenty years, as a different curator or juror(s) selects the artwork to be featured both pictorially and in essay each year. 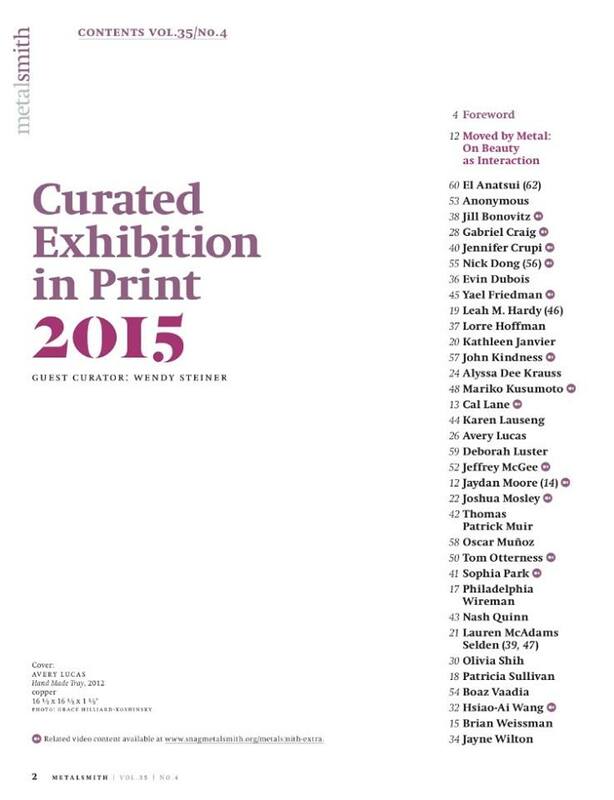 Excerpt, contents, Metalsmith magazine’s Exhibition in Print 2015. Image appears courtesy of Metalsmith and SNAG. Guest Curator Wendy Steiner selected thirty-four artists based not only in North America, but also practitioners currently living in Taiwan, Israel, Ireland, U.K./London and Nigeria. I am thrilled to have two of my Widget Lockets (No. 2 and No. 5) featured on page 18. Steiner brings an entirely new “read” on my use of Victorian-era jewelry being brought into the age of technology and Twitter. Any metalsmith, contemporary jeweler with a studio practice or student pursuing a degree in metals/jewelry should look into becoming a member of the SNAG organization, which also includes a subscription to Metalsmith magazine. I’ve found exhibition opportunities to apply and show my work from reading the weekly email newsletters sent to members, including the juried Soulcology in Metal exhibition in Connecticut last year. In addition, the Center for Craft, Creativity & Design (CCCD) located in Asheville, North Carolina hosted an invitational, on-site exhibition this past July 31st – August 22nd, 2015 featuring Metalsmith magazine’s annual Exhibition In Print sponsored by SNAG; this exhibition at CCCD’s Benchspace Gallery was organized by curator Wendy Steiner in tandem with CCCD’s Assistant Director, Marilyn Zapf. I feel extremely fortunate to have been invited to exhibit both of my lockets featured in the magazine at such a prestigious institution and scholarly atmosphere, along with twenty other multi-talented artists that included Jill Bonovitz, Tom Muir, Sophia Park, Nick Dong, Jennifer Crupi, Brian Weissman and more. Coincidentally, Crupi and Weissman, along with myself, are all alums of the Metal Program at the State University of New York at New Paltz, located in the gorgeous and culturally-rich Hudson Valley of upstate New York. So, if you’re not one of the millions trekking to New York City or Philadelphia to see Pope Francis this weekend, pick up a copy of this magazine for a good read! Images used appear courtesy of Metalsmith magazine and the Society of North American Goldsmiths. Any recommendations of organizations mentioned in this blog post are solely my own choice and opinions, and I receive no compensation for any endorsements. I would have loved to go the NYC and see the Pope and also to see that exhibition. As you would know, I would love to see the “Moved by metal, beauty as interaction” exhibition. How engaging and thought provoking your pieces will be there. I like the way this is presented and I just know the people who attend will find this combination of Victorian and twitter confronting (in a gentle and interesting way) Beauty as interjection is yet another way of defining us as humans because it is so timeless. Hi Sharon! Thank you for your lovely feedback! That’s the beauty (no pun intended) of the print magazine: it “immortalizes” the physical exhibition long after the on-site show has passed. I couldn’t agree more w/ your thought that we all respond and generate our own individual reactions to our interplay w/ art – and especially beautiful art objects. I’m so appreciative of you dropping by today and commenting! I am always excited to receive my Metalsmith magazine; there is always something to learn, to discover or to admire. But this time, Patricia, knowing that two of your “Widget Lockets” were featured, well, it was quite a treat! Your post is an excellent reminder of how vital SNAG is to all of us, metalsmiths, students and professionals alike. Dominique, I could not have said this better than you just did: SNAG is vital to our community. I am a relatively new member of just three years even though I’ve been reading Metalsmith for much longer. You are too flattering in your kind remarks about my work. I love seeing (and reading) about your gorgeous metalwork even more. TY so much for visiting today and sharing your always-articulate insights with me! Congratulations! How exciting for you! Your widget lockets are both clever and beautiful. I wonder what the Victorians would have made of our both our current technology and self absorption? I would particularly like to hear Queen Victoria’s thoughts. Jen, what a accurate and truthful assessment of how Victorians may have reacted to our modern-day obsession of self and photo “selfies”. Oh, the irony that those persons living in Victorian times were supposed to be the self-absorbed ones! (thinking of corsets, jewelry focused on commemorating our lost ones, and all the famous portraiture of that era.) Thank you for your visit and bringing a further, even newer dimension into my discussion around Victoriana, technology and “self”! Patricia, bravo! I’m so excited for you and this is definitely NOT a surprise since I’ve been blown away by your stunning work for years. I am so happy you are getting this well deserved recognition. Thanks so much, Pallavi! I agree about Wendy Steiner’s essay – it’s incredible. Thanks so much for the follow and for stopping by!